Kalpit Veerval's impressive performance led to some funny jokes on Twitter. Kalpit is the first student to score a perfect 100% in the JEE Main competition. #Rajasthan is proud of you. 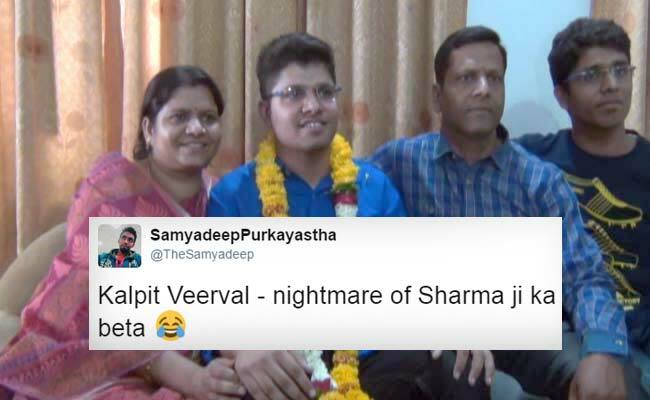 Kalpit Veerval, the guy who has officially beaten "Sharmaji ke ladke ko"
Kalpit Veerwal scored 360/360 i.e., 100% in JEE mains, creating a record. His parents: Woh dekho Sharma ji ke bete ki taraf. He scored 361. Arvind K - OMR checker is vulnerable. Kuch bhi likho sab correct ho jata hai. Sab mile huye hai. Rajasthan's Kalpit Veerval Topped The IIT JEE Mains, Scored 360/360. Two Minutes Of Silence For His Neighbours, Relatives And Cousins. Kalpit Veerval has also topped the Indian Junior Science Olympiad and National Talent Search Examination in the past. We wish him all the best for the future.